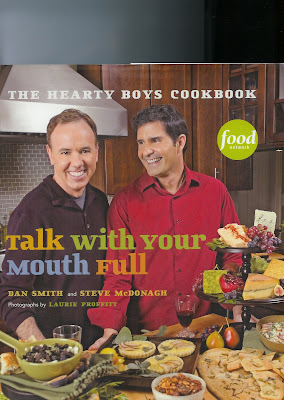 Talk With Your Mouth Full is the first cookbook by Dan Smith, 45 and Steve McDonagh, 43, “The Hearty Boys”. Dan and Steve, who own a popular catering business in Chicago, rocketed to fame in 2005, when they won the Food Network’s reality contest, The Next Food Network Star in 2005 (They won over about 10,000 other applicants). They host the popular show, Party Line With the Hearty Boys. Dan and Steve are a real life gay couple, as well as business partners. They reside in Chicago with their adopted two year old son, Nate. Dan and Steve did not attend culinary school, but came to catering as out-of-work New York actors, trying to pay the bills, working in all aspects of the food business. They refer to themselves as “accidental experts”. Talk With Your Mouth Full is a treasure trove of recipes and helpful hints for entertaining. Steve introduces each chapter with an anecdote. Dan presents each recipe along with his thoughts and Steve adds “practical tips”. Cooking With Your Mouth Full is appropriate for a sit-down dinner party with a few friends, but can serve as a primary resource for any size gathering. Most of the recipes are uncomplicated, but the results are impressive and fit for elegant parties. Categories range from hors d’oeuvres for passing, buffet fare, appetizers, main dishes, side dishes, desserts and libations. Sample menus with timelines and a liquor buying guide are sure to help reassure those new to home entertaining, as well as for old “pros” looking for great new ideas to ‘wow’ their guests. Talk With Your Mouth Full is a visually pleasing book. Its layout is attractive, with many photos of the authors and friends. Food photographer, Laurie Proffitt has done a superb job of photographing many of the dishes from the book. Attractive photos of the finished food entice the reader to look over the text and to try out the recipes. I wish there were even more photographs of the food, but understand that if all 125 recipes had been photographed, the book might have taken on encyclopedic proportions! Steve and Dan have provided an array of recipes inspired by Dan’s Italian heritage and Steve’s British roots. They are obviously familiar with other cuisines and their many ethnic inspired recipes can satisfy even the most jaded palate. Examples of some of the appetizers and hors d’oeuvres are Sliced Duck and Provencal Olive Tartine, Seared Ahi on Wonton Crisps, Artichoke Fritters, and Watermelon Gazpacho Shooters. Most of the recipes are easy to moderate in level of difficulty. Most could be safely prepared and served to guests without prior experimentation because they are straightforward and not fussy to prepare. The Stilton and Pear Tart, Moroccan Lentil Soup with Harissa Yogurt, and Truffled Mashed Potatoes are all very inviting And for the sweet tooth, some delicious possibilities are Lemon Brown Sugar Bread Pudding with Blueberry Cream, Rosewater Cupcakes with Grenadine Frosting and Sugared Rose Petals , Chocolate Cream Cheese Cupcakes and Steve’s Espresso Shortbreads. Dan Smith and Steve McDonagh have packed an incredible amount of information into Talk With Your Mouth Full. They could have easily published more than one cookbook with the information presented here. Talk With Your Mouth Full is not a basic reference, but is nevertheless packed with valuable information for anyone, even someone cooking just for family or for a friend or two. I’d recommend it as a worthy addition to the collection of any serious cook. It’s one of those cookbooks destined to become stained and dog-eared from use, that I’ll return to many times in the future for years to come. Below is a short, less than two-minute youtube video of the boys explaining one of their cooking related passions.